Three guys. Three bikes. Three projects. There’s an engaging symmetry to Finding Main Street’s (three words!) 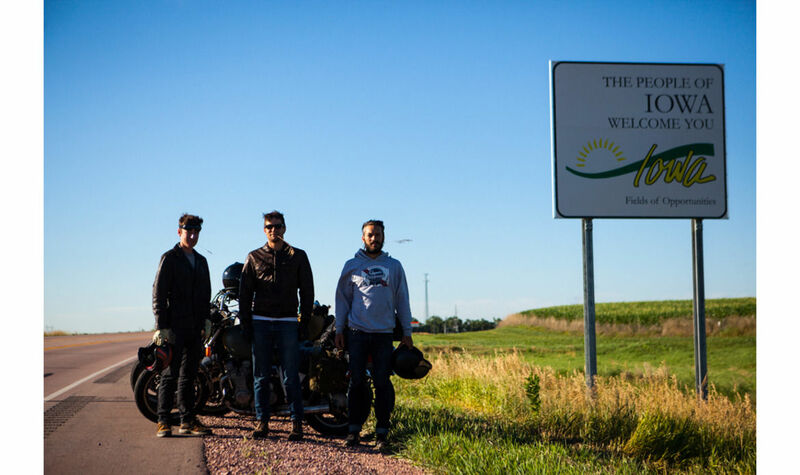 motorcycle roadtrip, and as they recently passed their halfway point, we dropped them a line to catch up. After driving 400 miles through the night, they’d reached the Atlantic at 5:30AM. It’d been 38 days since they left San Francisco, and they’d just finished their first Transcontinental leg. Here, we rested. Finding Main Street is a documentary film, photography project, and existential exploration of our generation’s USA. For the twentysomething bikers, the attitude is more receptive than prescriptive. What they aim to find: America, and the spirit that makes this country great. While the goal may seem slightly amorphous, this is a trip best left open-ended. After laying out the maps, tuning up the bikes (Maxim, Magna and Seca), and generating funding from Kickstarter, their plans were prepped. Without over-thinking, the three-friends took to the road. For as much impulsiveness as a roadtrip requires, Finding Main Street has approached the trip with intentionality and maturity. Yes, they’ve thrown a wide net of trying to understand “America,” but they may just be qualified for the task. Wyatt McCall and brothers Brant and Dylan Ozanich grew up in small towns in Northern California. Early in their twenties, they moved to The City (SF). Both living experiences have given them a balanced perspective for their trip, and with their photographic and journalistic skill sets, these three friends are actually beginning to capture the elusive yet descriptive slices of American life. Over the course of the trip, their musings have become more refined. At the halfway point, they’ve now hit their stride. Reflecting on Detroit, they observed an urban city in touch with America’s rural side (well said). And, when entering Virginia, they noticed a change in the speech and attitude of the people. As anyone with roadtripping experience knows, your observational tuning fork becomes more on pitch as the journey goes on. Finding Main Street has found their timbre. In Travels with Charlie, Steinbeck does his usual routine—pinpointing the humanity we all know, but haven’t found the words to describe—while he travels cross country. More than fifty years later, Finding Main Street has attempted the same project, and hopes to unearth the thoughts and hopes of our generation. What they’ve found has lifted their (and our) spirits: above all, we have noticed a certain untouchable pride in people. When we heard from them, they were resting. Now, they’ve hit the road again, out to complete their journey back to the West Coast. We’re looking forward to seeing where the road takes them, and to hear their thoughts (visually and verbally) as they soak up the people and landscapes that define our America. To follow the journey, visit Finding Main Street or follow on Facebook. All images by Finding Main Street.